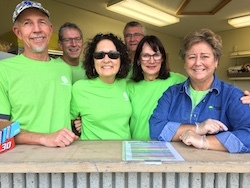 Providing the concessions for the fall Midget Football games on the Seward High football field is a great activity for our Optimist Club and an exciting vehicle for the youth and their families to learn about the Seward Optimist Club. Everyone appreciates our efforts! We offer fresh popcorn, hot dogs, candy, and assorted drinks. Customers often comment that the Seward home games provide the best concession stand in the league! Profits from our concession stand are donated back to the Seward Recreation Department. In the past two years, the Seward Optimist Club has donated a total of $1,100.00 to Seward Park and Rec to be used for the Midget Football Program.